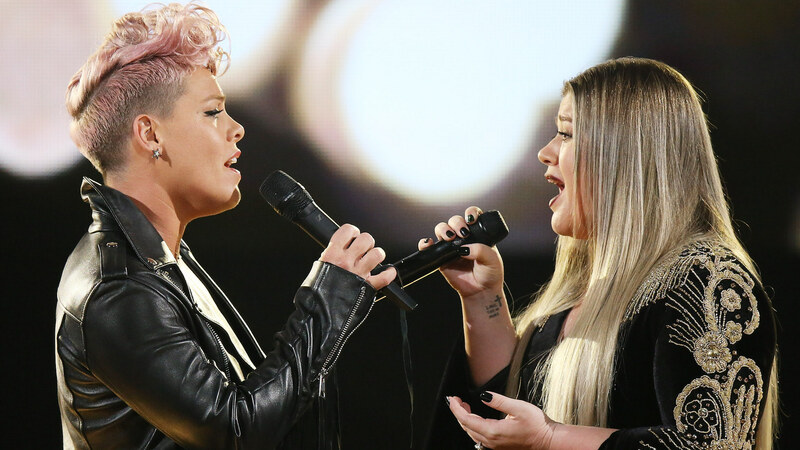 It’s been a long time coming but it’s finally happened: Pink and Kelly Clarkson sang a duet at the 2017 American Music Awards. The two powerhouse singers opened Sunday night’s award show before performing separately later that evening. Their duet of R.E.M.’s “Everybody Hurts” was even more memorable than their solo performances, not only because it was easy to see these two are a musical match made in heaven, but because of the message they wanted to send with their duet: that we as a nation can survive any troubling moments if we unite and that in our shared pain, we can rise up and heal together too. Jamie Foxx introduced the two singers at the beginning of the show. He took a moment to explain why “Everybody Hurts” was chosen to open the show and the message the AMAs hoped to send in tasking Pink and Clarkson to sing it. It was at this moment that Foxx introduced a group of first responders, who he commended for their bravery, for running toward the danger and for helping others in their time of need. He also noted that 2018 should be a year of hope, of people coming together and staying strong. Then, he introduced Pink and Clarkson, calling them “two of the world’s most powerful voices” — and he’s not wrong about that. It’s easy to presume that Pink and Clarkson would knock this duet out of the park, but they also really poured their hearts and souls into this performance. Both women are fantastic at singing in a way that really tugs at the heart, so together, they just might ease all your worries with their song. Seriously, check out their duet if you don’t believe me; it’s so damn good. And if tearing up at the sight of these two amazing women singing together isn’t enough, why not bask in the glory of their fangirling for one another before the show? The pair couldn’t help but sing each other’s praises on Twitter ahead of the AMAs on Sunday night. Sometime during rehearsal, Clarkson tweeted out: “If anyone was wondering what @Pink is like in person, she’s the greatest human ever and I love her even more now after meeting/singing with her at #AMA’s rehearsal….can’t wait for y’all to see our silk routine tomorrow,” referencing Pink’s solo performance which featured an acrobatic silk performance. Pink also sang very high praises of Clarkson on Twitter before their duet. “This woman has a direct line to outer space with that voice. I feel lucky to stand next to her when she sings. Tonight will be an honor for me @kelly_clarkson #AMAs2017,” she wrote. This was certainly a strong way to open the 2017 AMAs, and frankly, it feels necessary. With Pink and Clarkson coming together to give a voice to the feelings many of us have felt to some degree over the course of the year, it admittedly feels cathartic watching them sing such an appropriate song. However, it’s also hopeful too. Given the shiny and supportive demeanors of these women and the love they showed for one another before and during their performance, we can not only take away from their performance the acknowledgement that everybody hurts, but also that everybody can hope and love.